Valentine giveaway winner announced and a work in progress. Congratulations Elisa, please leave me a comment with your email address and I will arrange to send the gift to you. I would like to thank everyone who left a comment. I would also like to thank all the people who are now following my blog, I have hit over a 1000 followers this week and I am thrilled, I never imagined that so many people would be interested in my cross stitch. Talking of interest, you all seemed to like the cupcakes pattern I put on as a freebie, 900 people were referred from another site in one day just to see the pattern, I was so pleased. Here is the link to the site where you will find other free patterns. I am currently designing another cupcake pattern, in fact I could probably end up with a whole series, I just so love cup cake designs! And now for my current work in progress, it is a freebie from the Swappons blog here just click on the link and scroll down the page and click onto the PDF red square and you can download it. There are also lots of photos of finished works from people that have used the pattern, you will find lots of inspiration for the project in lots of different colours here. I am unsure how I am going to finish this one, I may do a box finishing. This is stitched one over one, it was surprisingly quick to stitch once I got started. 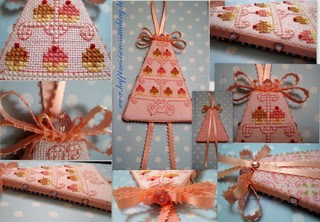 Have a happy stitchy week, thankyou for your visits! Hi everyone, I thought I would show you the gift I sent to my friend Angela (no blog) I decided to make a pretty little pillow trimmed in white ribbon and swarovski crystals. Angela has let me know she has recieved my gift and I am glad to say she likes it! The picture above shows the wrapping paper and gift tag I made using images from The Graphic Fairy blog here The wrapping paper can be found under Wallpaper on the link provided, I then edited the paper in Picasa 3 to write the greetings. The gift tag was made using an image also from The Graphics Fairy, not sure which section I got this one from though. All I did was print the image onto transfer paper and cut out the shape, I then sandwiched a small piece of felt in between and trimmed with dmc handmade cord. Here is the pillow, the cross stitch pattern is a freebie from Martines Blog here just keep scrolling down the page and you will see it there. If you would like to see it made in pink see my previous post here. There is still time to enter my Valentine giveaway here it is open until the 27th February 2011. Happy stitching everyone and thankyou for your lovely comments, they are all very much appreciated, I would also like to extend a warm welcome to new visitors and followers and of course my regular visitors too! Winner of my One World One Heart Giveaway! Congratulations Patty, I will email you! I would like to say thankyou to everyone who left a comment on this giveaway, please don't be too disappointed if you have not won this time, you still have another chance on my Valentine giveaway that is still open in the previous post below. Hi everyone, I know I have a giveaway running at the moment for the OWOH I decided to do a Valentine giveaway too, here is what I have made, I do hope you like it! Felt loveheart shaped pincushion embroidered with red roses - my own design. Polymer clay Valentine cake trimmed with a pretty red bow. If you already follow me please let me know and I will enter your name again so that you are entered twice. If you post this top photo on your blog I will enter your name again. If you are not already a follower and decide to follow me then I will enter your name again. I will announce the winner sometime on the evening of Monday 28th February. Here is the reverse side of the thread holder, the heart and the inside of the needlebook. I think these mice are so cute! I hope you like this cute giveaway. Thankyou to everyone who left a comment on my One World One Heart giveaway, I have replied to all of the emails except those that were set up as 'no reply emails', I appreciate every single comment and every visit from all of my stitching friends. Free cupcakes patern and a finish. Hi everyone, I finished this cupcakes design a couple of weeks ago, it is trimmed with my favourite swarovski crystals on the top and around the edges, I hope you like it! Please email from my profile for a free copy of the pattern. I have also finished the free design I was stitching the other week- photos below. Here is the finished pattern I was stitching a couple of weeks ago, I have not yet stitched it into a finished piece because I need some lilac and green fabric to match and I did not have any in my stash, when I do I shall post another photo. Thankyou for your visit, happy stitching! Tilda heart and Christmas in February! Hi everyone, firstly I would like to say a big thankyou to everyone that has left a comment on my OWOH giveaway, it seems there are a lot of pink lovers out there. The giveaway is open until the evening of the 16th February, the winner will be announced on the 17th, please see previous post to enter. And now for another pink creation of mine - Pink Tilda Loveheart. Thankyou Edgar it is lovely! And this lovely ornament from Carol, however I am unsure which is Carols blog? Thankyou Carol it is really appreciated, I look forward to hanging them on my tree next year. Welcome to all of my new followers, thankyou for your visits!